There are all sorts of rum shops all over Barbados. Depending on how you define a rum shop, there are from 1,000 to 12,000 scattered across the island. They include village shops that provide everything - groceries, bread, provisions - and are a local meeting place with rum and dominoes to while the hours away with good friends and talk. At the high end there are diners, cafés and even restaurants that feel like rum shops. Like Cutters, just past The Crane, for example. It has an open bar, entertainment and traditional ham, cheese and fish cutters along with salads and roast beef dinners. The ambience of the chattel house diner is very much like a rum shop. The food at rum shops is generally good West Indian fare of rice and peas, macaroni pie and chicken. Pudding and Souse is a specialty in many. Some will serve Jug Jug, Bajan Pepper Pot and more elaborate Bajan cuisine but mostly they just work with cutters and traditional village food. Jug Jug is a very West Indian dish but it is based in Scottish haggis and passed down to Barbados by the original Scottish workers. Pudding and Souse too has its origins in British food - The Blood Sausage and Head Cheese. The Blood Sausage was adapted by Barbadians using sweet potatoes with molasses or coconut milk (white pudding) in place of blood and highly seasoned with local herbs and pepper. Barbados souse, like head cheese, was a way of using odd bits like pig trotters, tails and heads; all byproducts of local farming. Today it is made from pig shoulders and tails; all readily available in the supermarket. 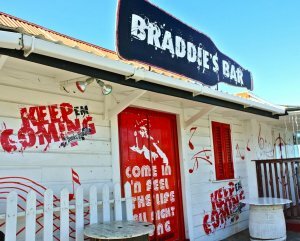 The first and last rum shops you are likely to see on your Barbados vacation are at those close to the airport, like Pug's and Frankie's Bar and Canteen. Pug's serves a Bajan buffet most days and Frankie's Bar and Canteen does grills and BBQ's with Bajan specialties. Both are a favorite watering hole for visitors who are in transit to another island. Just across the road from the airport, their delicious local food, at very local prices, are very popular with taxi drivers, airport staff and visitors. Many long stay visitors make a point of stopping at Frankie's or Pug's after checking in their bags at the airport on the way home. The last taste of real Bajan cooking and culture. Real rum shop lovers will stop in for a Banks or rum on arriving in Barbados for their holiday. Ready to experience the fun of a Barbados rum tour? Further down the road, towards Oistins, Bertie's stands out with its subtle shades of green, with Bertie the frog grinning at you. Bertie, the owner, puts on special evenings during the week with local foods like pig tail dinners. Evenings at Bertie's start at 4 pm. Further down this coastal route to the beaches is Oistins. It too has its own traditional rum shops across from the fisherman's market. The Oistins Fish Fry is a village community built to celebrate the concept of the chattel house rum shop and village life. In the old days, fish was grilled in coal pots along the side of the road with villagers sitting on steps, curbs, open verandas and inside on tables and chairs, or just strolling along eating and drinking on the street. Past that at St. Lawrence Gap, The Gap Bar celebrates every occasion they can, especially their own birthdays! Famous for their Sunday night karaoke street party, TML - One Love Bar is situated on 1st Street in Holetown. A wonderful place to stop at any time. Located on the beach in Weston, St. James, John Moore Bar is always busy. Pull up a seat at the front bar or step into the large back room and enjoy the fantastic beach view. There is plenty of room in this Shop and after you've enjoyed a few (hours and drinks) there is a bus stop right out front! Just up the hill from Gibbes Beach in village of Rock Dundo, St. James, is Chris' Place. Owned by Chris and Maureen, it serves Bajan flavors like Macaroni Pie, Cou-cou and Mashed Bananas; on Friday it's succulent Barbecue Ribs; Shepherd's Pie on Tuesdays for lunch. Call ahead. Directly south of the main bus terminal, on Church Street in Speightstown, you will find Sandra's Bar. A great place for some fried pork or chicken and some colorful conversation. At the Seaside Bar in Bathsheba you can enjoy your drinks on the deck looking out to the magnificent Atlantic waves. Feeling hungry? Try local favourites like Macaroni Pie and baked chicken! Since 1987, the Souse Factory has been producing some of the best souse on the island. Along with his specialty dish, Neville also serves up some wonderful BBQ'd chicken, pork and pig tails. It's an excellent way to spend your Saturday - pickled pork, a never ending rum supply and time with your wonderful new-found friends. Another favourite spot is The Village Bar at Lemon Arbour with some of the best pudding and souse and pickled sea cat in the island, along with fresh fish, chicken and steak, all served on a deck overlooking the Barbados countryside.